If you’re on the market for a standing desk, you will need to look into various features that will make your purchase worthwhile. We’ve teamed up with Reviews.com to give us the features that really matter. Adults who work in an office at a desk job spend equal, if not more, time there as they do sleeping. That amount of time can really take its toll on the human body. That’s why many people are adapting to the trend of standing desks to increase their productivity and health. Adjustability: When you have a standing desk, you shouldn’t switch from sitting for 8 hours to standing for 8 hours. A combination of sitting and standing tends to be the most achievable and realistic change for most of us. An easily adjustable desk can help us switch positions throughout the day. Some desks have an electric motor, hydraulic lever, or manual crank, to adjust the height, so think about what will be easiest or most comfortable for you. Maximum Height: Of course, you want a desk that can fit you and adjust to your height and eye comfort level. Reviews.com found desks with at least 48 inches of height, with a 20-inch sit-to-stand range, which is ergonomically suitable for people up to about 6 feet 7 inches. For proper posture when standing at a desk, see the image below. Warranty: Standing desks can be a substantial investment for your posture and health, and range anywhere from $500 to $1,500+. While the investment is worthy for your health, you might want to consider one with a warranty that covers any damage. Interested in a standing desk? Check out this review of the top 71 standing desks currently on the market. 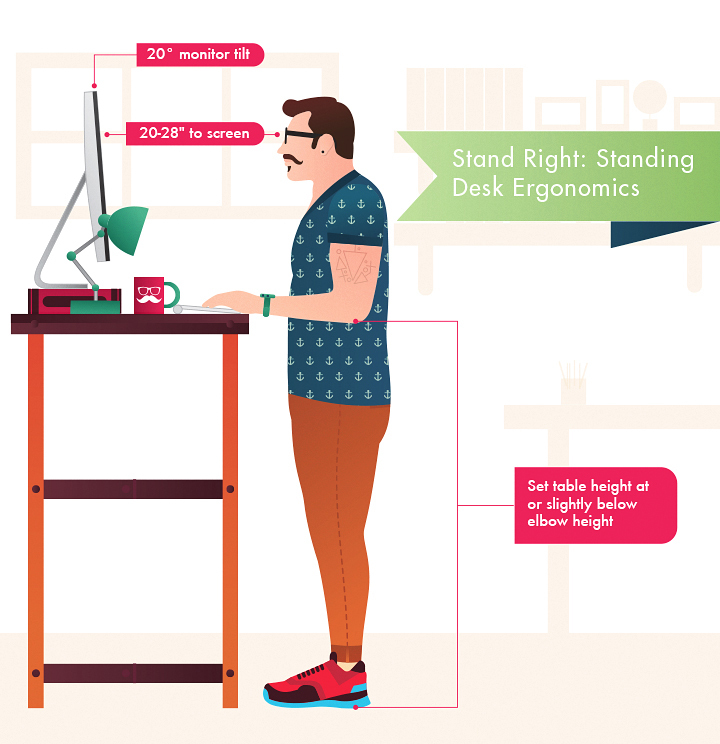 What to look out for when choosing a standing desk? We got you covered.